or any occasion to let your kids to have a special creative experience! Kids art parties last between 1-2 hours. Our instructor will work with you to choose an art project that will best complement the theme of your party. 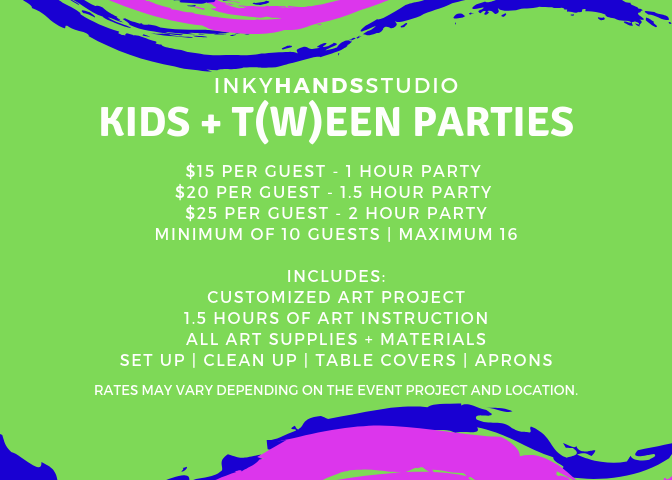 Coordinate with you to create a personalize art project or paint image for your party. Bring all all art supplies & materials, table coverings, smocks & extra tables (if needed). Give step-by-step art instruction and project guidance. Provide hassel-free setup and cleanup for your party. Provide the space (indoor or outdoor), tables and chairs. Extras: Our instructor will take photos during your event and share them with you. Please let us know if there is anything else we can do to make your event extra special.